Although a tourist spot, Oia remains an exceptionally artistic, hardly touched site; it is the part of the island least affected by tourism. A model of architecture, finesse and charm, Oia has its own fanatic followers: those who know how to appreciate what is different and unique! “Sea-wakened, proud / you lifted up your stone breast / speckled with the southwind’s inspiration / for pain to inscribe its very heart there. / For hope to inscribe its very heart there” (Trans. by Jeffrey Carson & Nikos Sarris). These were the words through which the great Greek poet Odysseas Elytis expressed his feelings for Oia in his poem “Ode to Santorini”. 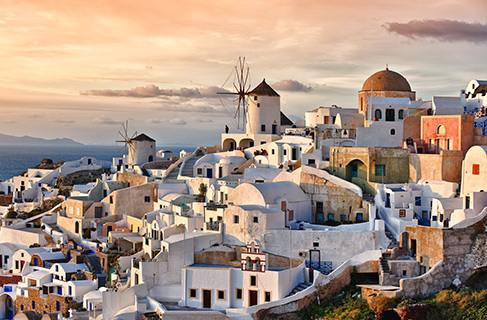 The traditional village of Oia –a listed monument– unfolds along the volcanic rocks; it is the jewel of Santorini! Adored by everyone for its eternal exquisite beauty and unforgettable sunsets, Oia seduces visitors her picturesque yposkafa, i.e. residences carved into the rock, narrow paths and imposing Caldera. “It is Oia that has made me wiser and helped me improve my humble perception of aesthetics; it taught me the art of subtraction, or rather non-addition, the value of harmony and the human scale” says fashion designer Yannis Tseklenis, in reference to the uniqueness of Oia. In the Middle Ages (1335), Oia was one of the castellos, the fortresses, of the island erected by the Venetians; it was called “Aghios Nikolaos’ Castle” or “Panomerea” (the Upper side). The district was handed over to the nobility family of the Dargentas, who were Latinized Greeks. In order to be protected from pirate invasions, they built a tower with an observatory, called “Goulas”. This tower included all residences, the greatest of all belonging to the Castellan of Panomerea (Duke Dargenta). In 1579, the site passed to the Ottomans for 250 years; during this period it suffered numerous pirate raids. In 1650, an eruption of Koloumpo, an undersea volcano, destroyed the region. After 1850, its residents, the Panomerites, who were great sailors, returned to the activity they were renowned for: 165 sailing ships criss-crossed the Aegean, the Mediterranean and the Black Sea carrying famous Santorini wine. After the end of the Ottoman Occupation (i.e. after 1830), the regional economy flourished. It was then that Pano Meria (the Upper Side) changed its name to Oia; it had already become a small residential centre with 2.500 inhabitants. The architectural masterpieces being restored today date back to that glorious historical period. 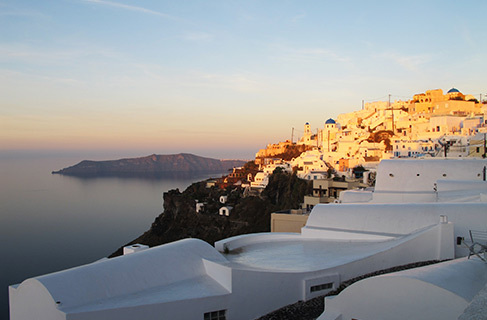 Oia lies at the northermost part of the island, 11 km northwest of Fira, at an altitude of about 121 metres. The residential complex of Oia was the first one in Greece to be listed as an architectural monument (in 1976 by EOT/ Hellenic Tourism Organisation); it was integrated into the Programme for the Development of Traditional Hamlets. 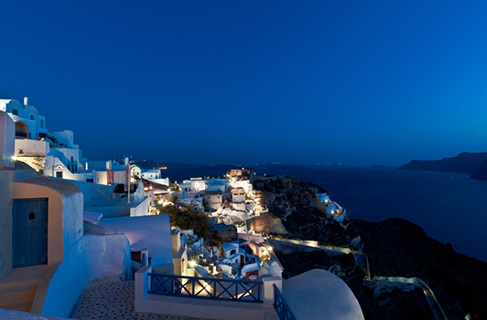 Oia is divided into two sections by a central road (Nomikos Street): one faces the Caldera and the cliff and it is where the yposkafa residences are, while the other contains “conventional residences”, the so-called kapetanospita (Captains’ Homes). The yposkafa are carved in the volcanic rocks and used to be where ship crew members lived. On the other hand, kapetanospita used to be ship owners’ homes; in other words, they belonged to middle-class members. The morphology of yposkafa was determined by local materials and the use they were put to. Today Oia Community includes: Oia, Finikia, Tholo, Armeni (small bay), Ammoudi (small port), Mavri Petra (Paradisos), Koloumpo and the islet of Thirasia. “This is where the beautiful and the pure emerged to become rock sculpture; this is where the colorful sculpture of innocence stemmed from” writes Kadio Kolymva, a writer from Oia, referring to the landscape. A typical feature of Oia is its 70 small and big churches and its districts, each one with its own historical particularities. The first district one goes through at Oia is Perivolas, with St. George’s Church. Walking along the central marble-paved street with the two large church domes (St. Spyridon and Ressurection Churches), we come to the district called Monastiri (due to the numerous chapels in it). The downhill street leads to Armenaki, while next to Monastiri lies the district of Lotza. Then follow Goulas and Vounaras districts. Getting to Oia from the road below, we come to Sideras with its magnificent mansion-like kapetanospita. The earthquakes of 1928 and 1956 destroyed a large part of this unique residential complex. 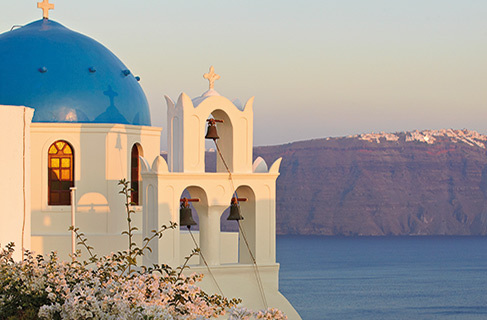 Quiet yet cosmopolitan, Oia is chosen by those who seek serenity, calmness and luxury in their holidays. This is why here are some of the best places to stay on the island, as well as luxurious restaurants, exquisite galleries and a wide range of shops. We have wandered around its alleys, chatted with its people and share with you all those features that make it stand out! Most people get to know Oia just superficially having spent an evening there squeezed with hundreds of others to enjoy its dream-like sunset. We are indicating eight known and unknown points worth including in your itinerary so as to experience the real splendour of Oia! No matter whether you have heard about it or seen it in pictures, you will not believe your eyes! The ideal spot to enjoy the sunset is the walls of the Castle and the surrounding cobbled streets. You have to get there in time to secure a position. Turn your back to the “fireball” dipping into the vastness of the Aegean and take a look at the side of the Caldera. The colors on the rocks are impressive (especially from Armeni and Thirasia). The best sunsets are not to be enjoyed in the summer, since the haze detracts from the beauty of the sunset. 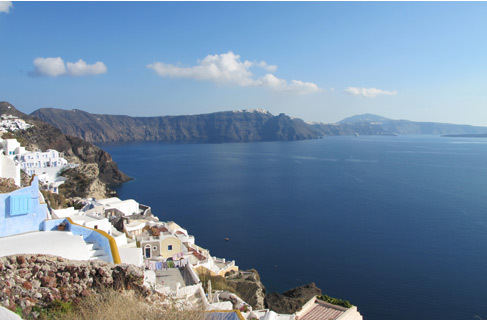 The maritime history of Santorini is fully documented here. You will see all those tale-telling objects of the development and flourishing of Oia in the 19th century. In 1951 Captain Antonis Dakoronias established the Maritime Museum of Oia, which is today housed in a wonderfully preserved kapetanospito (captain’s residence). You will see figure-heads, anchors, carved sailors’ chests, sextants, models and aquarelles of old and modern vessels, books, maps, charter-agreement documents, marriage and dowry contracts, sailors’ wills and photos. Tel. +30 22860-71156. Opening hours: 10.00-14.00 & 17.00-20.00, weekdays except Tuesdays until 15 November. Only when you find yourself in Finikia, a hamlet on the southwest side of the island before Oia, will you realize its uniqueness! It is built on both banks of a dry stream bed, the road “flowing” in the middle. Its typical features are traditional houses, carved in the mountain, and kanaves (the cellars where locals used to keep and age their wines). A visit to Panagia Matrona will top up your positive energy. Wander around the vineyards and visit the chapels of Santa Kyriaki and St. Konstantine. If you walk up to Kyra Panagia, you will enjoy the sunset! It is the only winery in this district. Paris Sigalas produces excellent wines from local varieties. Visit the winery, taste the wines and enjoy a rest in the vineyard garden overlooking the sea! To get there, take the road along the coast; when you reach Baxedes beach, you will see the winery. Alternatively, you can set off from Oia, cross Finikia and head down to Baxedes. Along with those of Tholos and Finikia, there are a total of seventy chapels: most of them are private. The most beautiful iconostases are to be found in Panagia Platsani, St. George’s in Perivola, St. Spyridon and Panagia Matrona in Finikia. Next to each church there is the panigirospito (feast premises), where preparations before the Saint’s Feast Day take place. You can reach Ammoudi either by following the coastline road behind Oia or going down the 214 stairs connecting it to Oia. This bay used to teem with life, for it was the transit trade port. Ammoudi, along with Armeni (on the front side of Oia), used to be the ports of Oia in the 19th and 20th centuries. The boat for Thirasia sails from Ammoudi. Today, there are fish tavernas by the sea, painted in bright vivid colors with the houses of Oia overhanging aboveas if forming a crown at the top! You can enjoy fresh fish, after a stroll along the footpath leading to the rock of St. Nikolas Peramataris. On the northern side of Oia, there is the district of Baxedes, a green expanse with a fantastic beach; on the southeast side there is Columbus, one of the wildest pebbled beaches of the island with crystal-clear waters. There is no tourist infrastructure here. You will find some shade only under the black-grey rock. Kantharos to the west of Oia is a small black sand beach and a serene atmopshere. You can also swim on Armeni, if you walk down the 300 stairs from the central road of Oia (Nomikos Road). To the east of Armeni beach you will find the chapel of Agii Eftapedes (The Holy Seven Youth from Ephesus). To the west there is the small Armenaki bay. Swimming in the fathomless deep waters is indeed an awesome experience! For the more adventurous, diving from the rocks at St. Nikolas offers a unique thrill! Thirasia, the islet opposite Oia, is a part of the coast that was cut off when the volcano erupted. Its inhabitants live in Potamos and Manolas, where there is hardly any tourist development. Visitors can come to Thirasia at Korfos (the old harbor) by tourist boats, where they can enjoy a swim and a meal in one of the quaint tavernas. Thirasia is connected to Oia by boat, from the port of Riva, where there is a beautiful beach. It is worth visiting the chapel of Santa Irini, Panagia of Langadi and the Monastery of the Assumption with its impressive golden iconostasis from Russia.